Echoing the words written on Harry Stevens’ ‘Femme Bien Informée’, this week’s poster is ‘A Tribute to a Master’ – Pablo Picasso, born October 25, 1881. London Transport published this poster in 1972. It was designed by Harry Stevens to promote London’s many incredible museums and art galleries. The ‘femme bien informée’, who looks as though she has just stepped out of a painting by Picasso, is admiring a selection of famous paintings from the National Gallery Collection such as The Arnolfini Portrait, by Jan van Eyck and The Fighting Temeraire, by J M W Turner. At the bottom of the poster is an exhibition label reading ‘by Harry Stevens, London Transport Art Collection’. 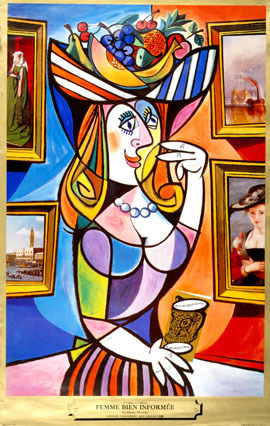 As well as commemorating the art of Picasso, Stevens also pays tribute to the London Transport poster by labelling it as part of an ‘art’ collection. By this time London Transport had indeed become known as a major patron of the arts. However during the 70s it increasingly contracted publicity out to agencies, meaning that direct commissions with artists and graphic designers such as Stevens were less common. With no formal art training, Stevens started his design career in the exhibitions and display trade. He went on to become a prolific freelance commercial artist, specialising in poster design, and in 1963 won the Council of Industrial Design Poster Award. With a succession of bold designs, Stevens maintained the presence of strong graphic art on the Underground.